There is a radio advertisement that talks about sailors who have crossed the equator. They call them Shellbacks. So, they named the rum the Shellback Rum. I have not crossed the equator on the water, though I have crossed it many times by plane. Exactly how many countries lie on the equator, and what is the equator? The thirteen (some say 16) are: Ecuador, Columbia, Brazil, Sao Tome & Principe, Gabon, Republic of the Congo, Democratic Republic of the Congo, Uganda, Kenya, Somalia, Maldives, Indonesia, and Kiribati. So, Brazil and Kenya might have been the only places where I have been on the equator, unofficially, of course. This should be a first, actually standing on it or both hemispheres at the same time. The equator is an imaginary line on the earth’s surface, equidistant from the North Pole and the South Pole, dividing the earth into the Northern Hemisphere, and the Southern Hemisphere. Of course, most of us have lived our lives in the Northern Hemisphere, and experience the seasons as such. The latitude of the equator is defined as zero degrees. The sun passes over the equator just twice a year at the March and September equinoxes. At the equinox, the light rays of the sun are perpendicular to surface of the earth at the point on the equator experiencing the solar noon. Also, I did not realize that places on the equator experience the quickest sunrises and sunsets since the sun sets and rises almost vertically every day of the year. This makes the length of the day fairly constant throughout the year. Here in California, we experience longer summer daylight, and shorter winter daylight. Logically, the earth also bulges at the equator. The average diameter at the equator is 7922 miles, whereas the diameter at the north and south poles is 27 miles less. 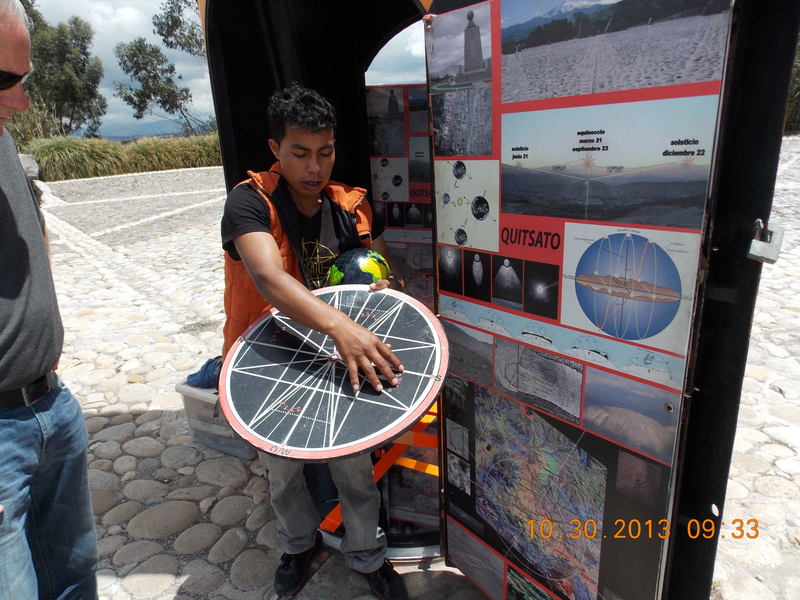 The equator is also not fixed since its true equatorial plane is perpendicular to the earth’s spin axis. The point that I want make about being on the equator is that seasons change very little. Temperatures are warm year around. The majority of places on the equator are near oceans (Pacific, Atlantic, and Indian) or rainy during the year. Only during these rainstorms do the temperatures drop much. Ecuador, where we are, is the only place on or near the equator with snow on the ground. This occurs at the southern slopes of Volcan Cayambe, with an elevation of almost 19,000 feet. We learned more on this visit however. 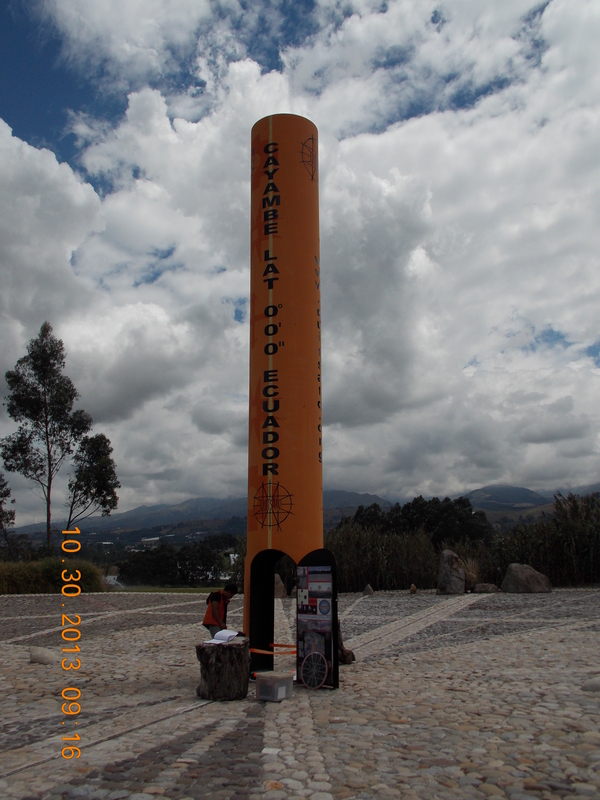 The Quisato calendar or solar clock is the first monument in the history of Ecuador that is precisely located on the equatorial line. 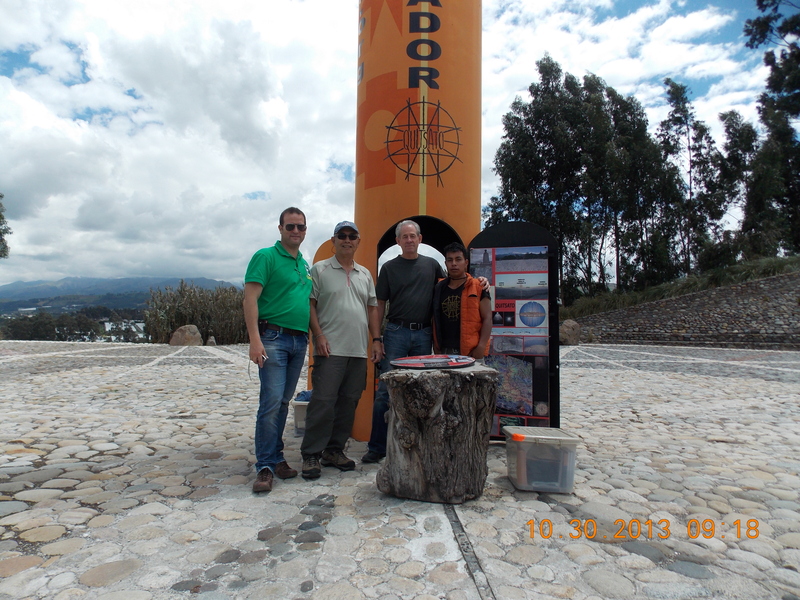 This line or Parallel 0 0’0″ was located by the Ecuadorian Geographical Institute using satellite technology and GPS. Who knew?